On January 13th and 14th, over 5,000 Fiat workers at Turin's main factory vote on a new contract which drastically increases hours, reduces breaks and restricts industrial action. Workers are being blackmailed by the management with the threat of relocation if they vote against the contract, and the trade unions at the factory are doing nothing to defend the workers. The new contract is essentially the same as that imposed on Fiat workers at a plant near Naples six months ago. The contract involves flexible working hours in three shifts, fewer breaks, and a ban on spontaneous strike action. In the event that workers vote down the contract, the company’s board has threatened to shift production out of Turin. According to details of the new contract: instead of the former system of 10 shifts in the week, workers will now be called upon to work 18 shifts. This will consist of three shifts per day beginning Monday morning at 6 a.m. and finishing on Sunday morning at 6 a.m. The rest of Sunday remains free. Working time is officially 40 hours per week, but under the new contract, workers can be called upon to work up to 120 hours overtime per year. Since Saturday is a normal working day, there is provision for two days’ leave every fortnight. Every working minute has been planned out in detail. In the course of every eight-hour shift, workers are entitled to just two (instead of three) breaks of 10 minutes, with meals to be taken at the end of the shift. Sick leave is to be strictly limited and sickness benefit reduced, due to what the management regards as excessive absenteeism. A similar agreement was put forward last summer to workers at the Pomigliano D’Arco factory near Naples. It was claimed at that time that such a contract was an “exception” and necessary to prevent the transfer of the Panda model to a Fiat plant in Tichy, Poland [Fiat workers in Tichy have themselves taken action over working conditions - libcom ed.]. Faced with this blackmail, the workforce voted 62 percent in favour of the contract. Now the exception is to be the rule for the company’s main plant in Turin-Mirafiori. If the new contract is imposed there, then it is only a matter of time before it is applied to all of the 22,000 Fiat workers in Italy. The contract at Fiat will then serve as a role model for Italian industry as a whole and could replace the existing national wage agreement, which was first introduced in 1970 following a long and bitter labour dispute by Fiat workers in Turin. The new Fiat contract violates the existing national contract in several ways e.g., with its stipulation of a high number of overtime hours, the strike ban and the arbitrary exclusion of elected representatives in the factories. Company management has made clear it will only recognise employee representatives who have expressly agreed to the new contract. This means that delegates from the engineering union Fiom, which is affiliated to the largest Italian trade union federation, the CGIL, will no longer be invited to negotiations and banned from the factory for so far refusing to sign the contract. In order to circumvent the existing national agreement, Fiat has withdrawn from the employers’ association Confindustria. At the same time, Fiat management has the support of many Italian entrepreneurs. Fiat CEO Sergio Marchionne was named “Entrepreneur of the Year” in 2010 by the pro-government and pro-business newspaper Il Sole 24 Ore. Marchionne’s offensive against the workers of Turin is being keenly followed not only by the Italian bourgeoisie, but also by the Berlusconi government. The attack on the workforce at of Turin-Mirafiori is an important part of Marchionne’s strategy for global market share against competitors such as Volkswagen and General Motors and Japanese and Korean car manufacturers. To this end, he plans to drastically reduce costs, while also seeking closer cooperation and a possible merger with US automaker Chrysler. At the beginning of the year, the Fiat group was split up and placed on the stock exchange in two parallel companies, one for passenger cars and another for commercial vehicles. The production of cars is now conducted by the so-called Fiat SpA, with Fiat Industrial assuming responsibility for the (still profitable) production of trucks and construction machinery. In Turin, Fiat is planning to build a new Jeep and an Alfa Romeo in a joint venture with Chrysler. The aim is to double the production of autos. On Monday of this week, Fiat raised its stake in Chrysler from 20 to 25 percent in what has been described as a further step towards gaining full control of its US partner. The company has said it will invest €1 billion in the Fiat-Chrysler project in the parent company at Turin-Mirafiori—so long as workers vote in favour of their increased exploitation. In a clear case of blackmail, Marchionne threatened to halt auto production at Mirafiori: “If 51 percent are against” the contract, then Chrysler will produce exclusively in the United States. Marchionne then praised the American trade unions, which had understood “that the jobs of their members depended on the success of the company on the world market”. Following the outbreak of the economic crisis in 2008, Chrysler and the two other two major US auto companies were temporarily placed under the direction of the Obama administration, which, in close cooperation with the United Auto Workers union, imposed wage cuts of up to 50 percent and other attacks on benefits. Despite the massive pressure exerted on the workers at Turin-Mirafiori, the result of the referendum remains open. About 15 percent of the employees are members of the Fiom trade union, around 38 percent belong to other unions and 47 percent are non-unionised. The Catholic and “yellow” unions (Fim, UILM, Fismic and UGL), which all signed the new contract on December 23, have responded with a campaign for a “yes” vote. The chairman of the Christian trade union federation, CISL Raffaele Bonanni, declared glowingly that the contract guaranteed “a multibillion investment; it is finally a positive sign for Italy”. In newspaper interviews, the union leaders have even claimed that assembly line workers could earn up to €300 per month more when the plant works at full capacity. The bureaucrats studiously ignore the enormous health problems involved in such round-the-clock working. While the Fiom and CGIL officials have not signed the contract, they are vehemently opposed to any sort of principled opposition against it. Their call for an eight-hour strike on January 28 is a pathetic gesture aimed solely at creating an outlet for the workforce’s anger and frustration. The Fiat Group has production facilities in Italy, Poland, Brazil and the United States. In all these works, workers face extortion tactics by management. 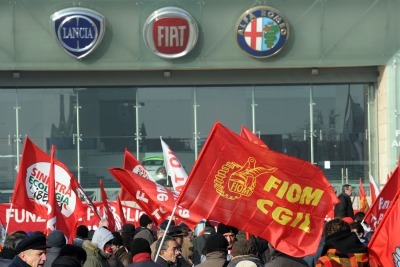 Instead of uniting Fiat workers with their international counterparts to mobilise jointly against these attacks, the union officials are focused entirely on improving the balance sheets of the company in Italy. The bureaucrats are able to base their plans on an analysis drawn up by 46 economists and university professors. The 46 academics, who are either members of, or close to, the centre-left political camp, criticise the new Fiat contract in an open letter titled “Produce and work better with democracy.” In this letter, they describe the new contract as a “pre-industrial strategy by Marchionne and the Agnelli family”, which contains no convincing strategy for the future. In order to secure auto production in Italy, the authors state, it is necessary to make a far greater commitment to research and development. “It seems that the contract is not appropriate to boost production and improve quality”, they write. They criticise the fact that Fiat has circumvented the national contract arbitrarily and excluded trade unions from the factory. “There are alternatives”, they continue, and then refer to the German Volkswagen Group, whose own crisis management strategy also involved intensified exploitation of the workforce and was drawn up in close collaboration with the German trade unions. The dictionary says .... "A drama or literary work in which the main character is brought to ruin or suffers extreme sorrow, especially as a consequence of a tragic flaw, moral weakness, or inability to cope with unfavorable circumstances." The new contract may (or may not be) bad news for FIAT employees, but it is not a tragedy. I'm not sure what constitutes a tragedy, but more money and shorter breaks do not. Where's the ruin or the extreme sorrow? The only thing that has actually died is the application of the national contract at FIAT. To be fair, Ed's article does not adopt a particular mournful tone - so why has the editor chosen to give it an inflammatory, misleading and subjective title? The tragedy comes from the history of this plant. We continue to live in a time of major retreats. The Lordstown, OH plant, scene of major wildcats, has been stripped down into a plant and workforce that is no different from any of the other non-militant unionized auto plants .... though there are some stirrings at Chrysler Warren. By the way, it is a crazy thing with the threats to move the Panda production to Tychy, because they moved Panda production out of Tychy when unions were taking action there. And recently they cut 1400 jobs and moved them to Serbia, which is paying Fiat a subsidy of 10,000 euros per worker to move the jobs (financed by Russia). We did a solidarity action 2 weeks ago in two factories in Poland and in Serbia. The workers really need to be organizing internationally.